Neck heating pads are location-specific heating shoulder wraps that enable you to treat the hard to reach regions of the shoulders and neck (Source). Neck heating pads generally feature contoured designs that are engineered to provide a close and customized fit for your neck, commonly using weighted edges and clasps to ensure a tight fit (Source). They typically clasp and contour pretty securely to your torso. Because of this, many users are able to experience the therapeutic effects of heat while they are working at the office, resting in a prone position watching television, or just sitting in a chair experiencing heated relief of neck, shoulder and back tension (Source). The Sunbeam Renue Heat Therapy neck wrap is our top pick. It includes a digital LED controller that features four different heat settings, a two hour automatic shut off, a power cord that is 9 ft. in length and a completely washable pad. It is designed to provide full back comfort, not just covering the neck, but stretching down the back to ease tension in the shoulders as well as the upper and middle back regions. User feedback is overwhelmingly positive for this neck and back heat therapy wrap- many people report that it provides large heating coverage and a needed dose of pain relief. The material is pretty soft and the magnetic closure in the front effectively holds it in place- with many users satisfied that it helps relieve pain associated with degenerated discs, muscle tension, osteoarthritis, sore shoulders and a variety of other neck and back maladies. Let's take a look at five of the best-selling neck heating pads on the market today and see how they compare. This two pound, Sunbeam 885-911 Renue Heat Therapy Neck and Shoulder Wrap is an excellent neck and product with an automatic two hour shut off feature to give you peace of mind. Its users love how comfortable and exceptionally light it is on their shoulders, but would have liked to have more color choices available. The wrap is made out of a soft fabric that is machine washable and has two magnetic clasps that help hold it in place. It has ten heat settings, although most customers say you don’t need to go much higher than 3 or 4, to help soothe your shoulders and neck. One customer mentions that they got it for rheumatoid arthritis and also for the winter and really liked that it had a constant heat over the entire surface area. Another buyer really liked how soft and easy to clean it was, but at the same time had a problem with the neck opening saying that it was too generous. The majority of the purchasers of the Sunbeam Neck and Shoulder Wrap mentioned that it penetrated deep into the body and helped alleviate the pain. The most common issues people mentioned state that the Sunbeam neck and shoulder wrap loses heat intensity after a period of time, at first they say it is great but it doesn’t last. This fair priced heat therapy wrap is a good option for those that have aching neck and shoulder pain and are looking for a reasonably priced product. 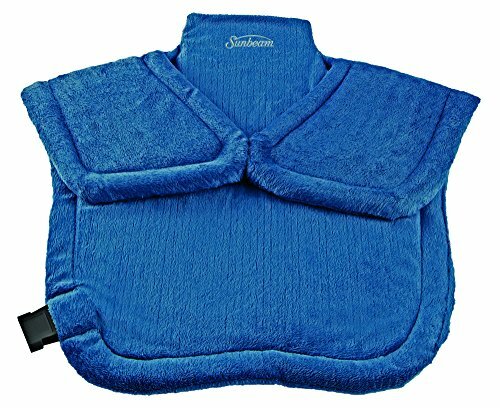 The 2.8 pound, Sunny Bay Long Neck Heating Pad, Blue is a microwaveable and freezable product designed for pain relief and made of 100% polyester. It is a useful neck and shoulder pain reliever that stays in place even if you are moving around. Its users really seem to enjoy the length of it claiming that it helps with covering all the areas that they need in the upper neck and shoulder area. However, some say that it has an earthy smell that they seem displeased about. The Sunny Bay Heating Wrap is used for heat, but you can also put it in the freezer and use it as a cooling wrap. The Long Heating Pad comes in a dark blue fleece but the manufacturer states this wrap is NOT machine washable. 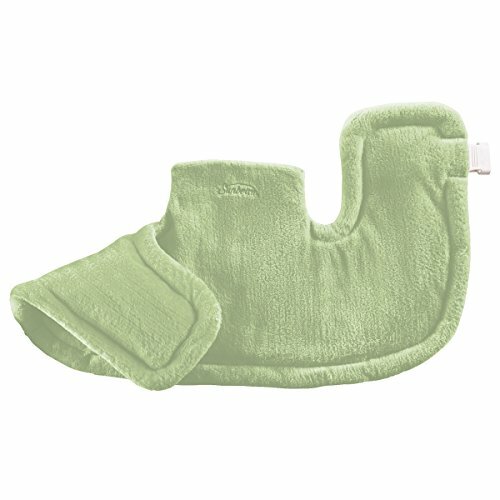 One user mentioned the heating pad has a thick fleece that gently protects you from the heated “rice” on the inside. The general consensus among most people suggest heating it for two minutes, shake the heating pad around, put it back in for another 30 seconds and it gets to the perfect heat for them. Another user says they only heat it for 90 seconds and it super soft and stays in place and really helps with their neck and shoulder pain. Many customers that disapproved really didn’t like the smell while others had a problem with weight or the lack of long lasting heat. The Sunny Bay Wrap is a reasonable option for those looking for a long neck wrap that they can either use for heat or cold and not have to worry about it sliding out of place. This 3.4 pound, My Heating Pad Neck & Shoulder Wrap is great for those looking for a hot and cold neck and shoulder wrap that has a soft fleece on one side for comfort and cotton fabric on the other side for extra heat. The users overwhelmingly enjoy the fact that it can be used with both cold and heat and how long it lasts, but have mentioned that you really need to follow the heating instruction before you use it. The My Heating Pad is handmade, eco-friendly, and made in the U.S.A. The shoulder pad was designed by a chiropractor to conform to the neck, shoulder, and upper back area. One user mentions how the fact that it weighs three pounds it helps push the heat down to penetrate the muscles deep. Another customer talks about how well it works with both the heat and the cold, mentioning how easy and reliable it is for them. The users that don’t seem to care for the My Heating Pad thought it was too heavy for them and it was not comfortable. One buyer, who mentioned they were petite, said that it put too much pressure on the nerves in their back and shoulders. Some users that were on the fence mentioned that they liked it but for them it did not maintain temperature for as long as they would like or that it failed to get cold enough. The My Heating Pad is an excellent choice for those looking for a heavier neck and shoulder hot and cold wrap. This 3.3 pound, Mind and Body Neck and Shoulder Wrap is a nice choice for neck and shoulder relief that can also be used for your lower back adding some versatility. Users enjoy how easy it is to use when you are in need of quick relief but some don’t like the longevity of the heat. The Mind and Body Neck Wrap uses microbeads that will not attract mildew or mold. Though it promotes the fact that it will stay odor free there were a few buyers that said it started to have a bad smell to it. The Neck Wrap also has a removable cover that is washable to keep clean. One customer mentions that they bought the Mind and Body Wrap a year ago and it is indispensable to them. They go on to say they put it in the microwave for about two minutes and it gives them 15-20 minutes of relief. A few of the customers talk about how the product doesn’t cover the whole area and others say the beads bunch up on them. The most consistent complaint is the heat only lasting between five and ten minutes. One user of the Mind and Body says that they bought it hoping for the heat to last up to twenty minutes and that it only lasted a couple of minutes. The majority of buyers don’t seem to have a problem with it although some that do like it do wish it would retain heat a little longer. 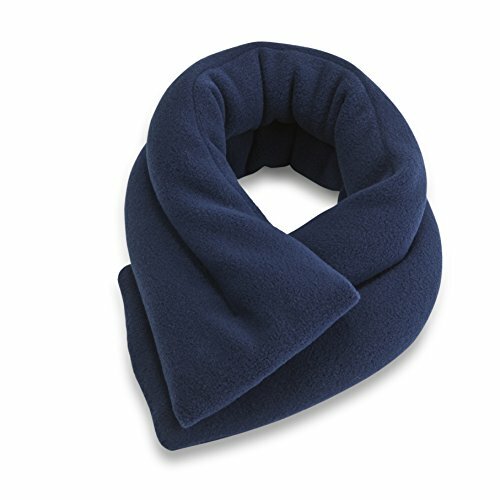 If you are looking for inexpensive hot and cold neck wrap then the Mind and Body Neck and Shoulder Wrap is a good option. This 2.1 pound, Sunbeam XL Renue Heat Therapy Wrap is a great neck, back, and shoulder therapy wrap with four heat settings and a two hour automatic shut off. Users love the overwhelming comfort and softness the Sunbeam offers, but it is corded so you need to be near an outlet. This Therapy Wrap has a nine-foot cord so it does give you range, and it also has an LED digital controller for adjustments. It comes with a two-year warranty and is fully machine washable. The Neck Wrap also has weighted edges to help push down the heat to increase the contact with the treatment area. One customer loved it but said that that they could only use it on the lowest setting for a longer period of time because it had a tendency to get too warm. They also went on and said it is most likely because of their age. More than a few of the customers that really enjoy the Sunbeam Therapy Wrap also mention that it does seem to have an unpleasant smell to it. A particular buyer wondered what the best way to get rid of the smell, but still thought it was a great product. The majority of negative comments are how it either is hot, but not enough, or that they can’t get past the smell. With the unit being an xl wrap is covers a wide area of your body. This mid-range priced neck, back, and shoulder therapy wrap is a good option if you can get past the smell to reap the benefits. Therapeutic heat healing is often called Thermotherapy and is frequently used to treat muscle pain because of how well muscles respond to the effects of heat. While warmth, in general, has long been considered an excellent source of relaxation, heat therapy can provide significant pain-relief benefits for many types of back and neck pain. Whether you get heat from a heating pad, a hot bath, heated gel packs or another type of heat wrap, there are inexpensive ways of achieving therapeutic heat to decrease the pain you're experiencing in your back and neck. Oftentimes the pain that we feel in our neck and back is a result of strains and other types of tension in the soft tissues and muscles- the result of this is that circulation is restricted and pain signals are triggered. These spasms and pain signals can range and discomfort levels from fairly mild to incredibly debilitating. Heat therapy can be one way of helping to decrease the pain you experience from the spasms as well as reducing tightness and tension in the neck and back. Heat therapy works by dilating blood vessels- the result of which is an increase in the oxygen flow and nutrient flow to muscles. As well, heat stimulation can help to engage the skin's sensory receptors, decreasing pain signal transmission to your brain and potentially helping to decrease your discomfort. Another benefit of therapy is that it can help to stretch your soft tissues, which includes your connective tissues, adhesions and muscles. This means that you will experience less stiffness with an associated boost in flexibility and comfort levels. 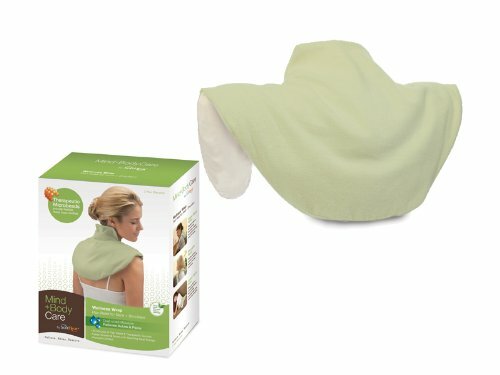 Heat therapy is a pretty inexpensive thing to try- the heated neck wraps that we reviewed above are fairly low-cost options, with the potential for a pretty high return on investment, considering that they will be treating potentially significant pain issues in your neck and back regions. Often times, heat therapy is used in conjunction with other types of medical treatments to achieve the best results. For example, many people receive nonsteroidal anti-inflammatory drugs, opiate medications, physical therapy, and even yoga- all of these types of interventions can be used in conjunction with heat therapy to treat the pain you're experiencing. 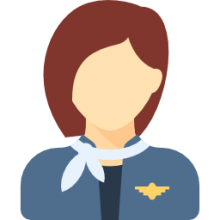 So if you are interested in experiencing heat therapy, check out our heat therapy neck and shoulder wrap reviews above, reference the comparison table, and read reviews on the individual product pages to get a sense of what other users have said about the product you are looking to purchase.